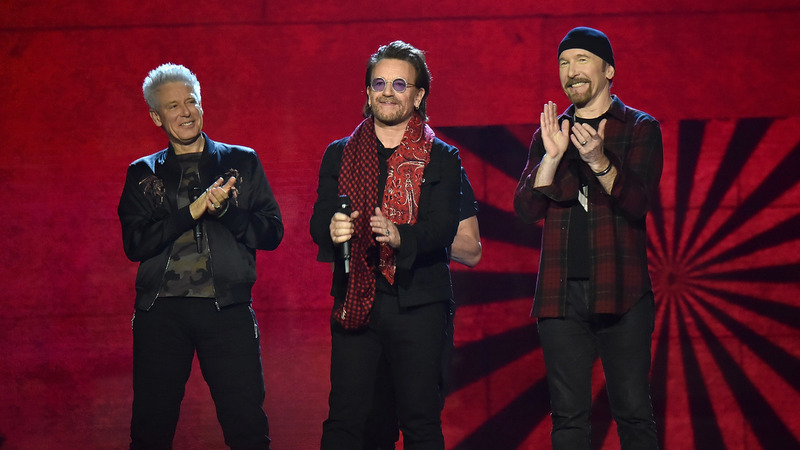 U2 frontman Bono honored the late Anthony Bourdain toward the end of the band’s special performance Monday at the Apollo Theater in Harlem. Bono spoke of losing a “lot of inspiring, useful people” over the past few years “who gave up on their own life” alluding to the apparent suicides of musicians Chris Cornell and Chester Bennington, as well as fashion designer Kate Spade. As for the performance, the band took a break from their Experience and Innocence arena tour to play a special one-night show at the legendary theater for Sirius XM, subscribers. The invite-only show had a star-studded guest list, including tennis legend John McEnroe, rocker Jon Bon Jovi, E-Street band guitarist “Little Steven” Van Zandt, and New England Patriots owner Robert Kraft. They also dusted off a few gems that have not been heard yet on the tour, including “Angel of Harlem,” the band’s homage to Billie Holliday. For that one, and a few others, the Sun Ra Arkestra backed them up. Other songs marking their first tour appearance included, ‘When Love Comes to Down,” ”Every Breaking Wave,” and “Out of Control” from “Boy,” the band’s 1980 debut album.